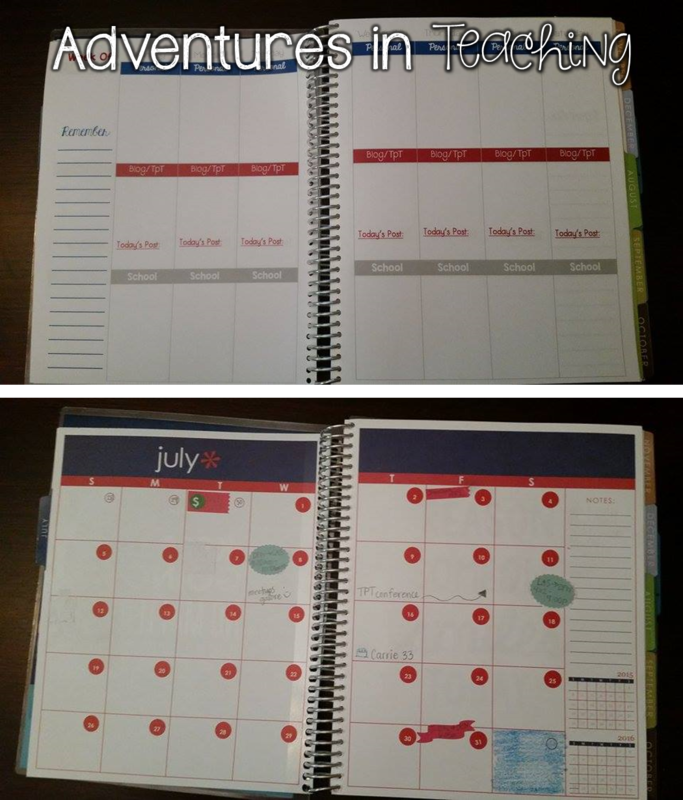 Thanks to a friend, I found out that you could order an Erin Condren notebook with a monthly calendar insert. I immediately jumped in and ordered one! It was so fun picking out my cover. I dedicatedly tracked my package and when it finally arrived, it felt like Christmas morning! 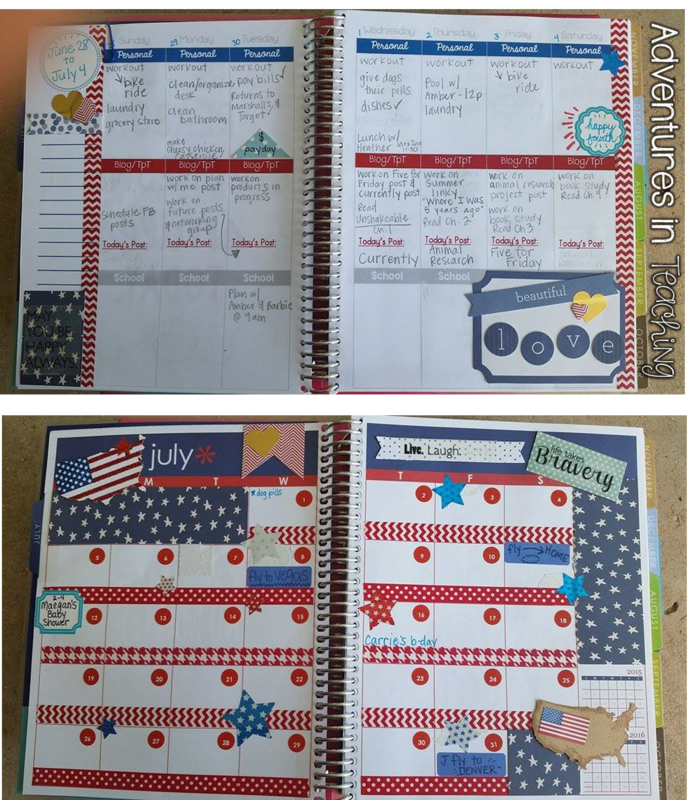 After browsing Erin Condren planner images, I began noticing how other people used the weekly pages. 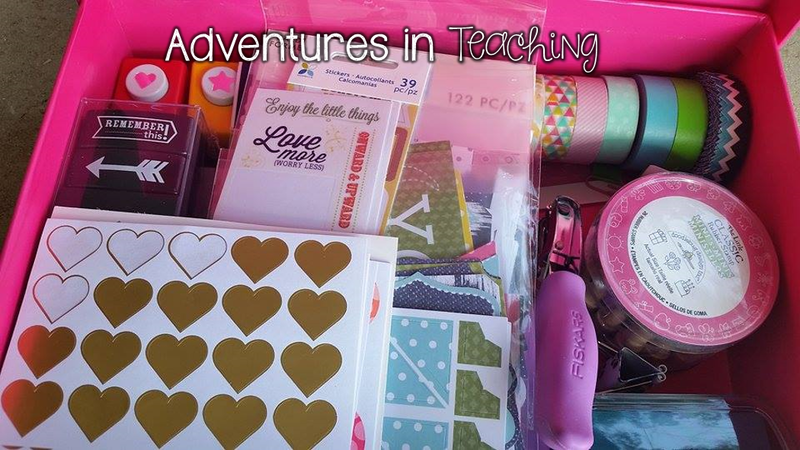 I started to see that with blogging and TpT, I could have been using my pages like that all this time! I spent the day whipping up my OWN vertical weekly pages. I used this video to see how to insert my own pages. It actually ended up being easy, but time-consuming. In the future, I’ll know to just order the weekly pages from EC. But, I am glad to know I can actually use the weekly portion from now on. Lesson learned! 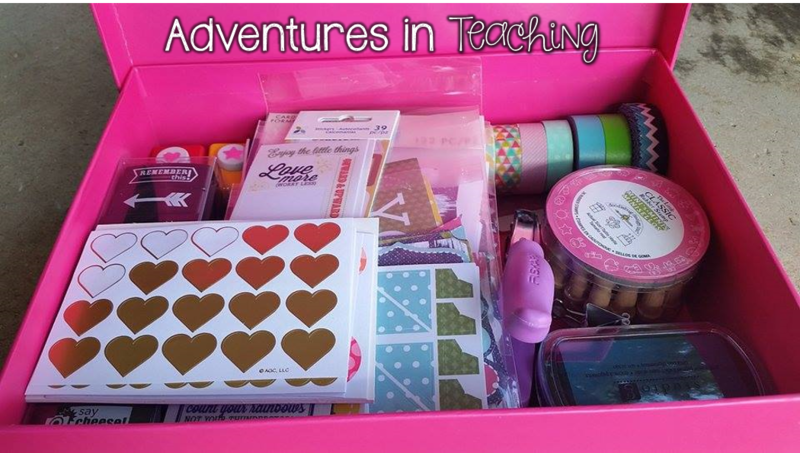 I’m linking up with Keeping Up With Mrs. Harris for Plan with Me Sundays! So here you have my pages BEFORE I figured out that this can be kinda like scrapbooking … but BETTER b/c I can look at it every.single.day. And here are my pages NOW! I had so much fun adding stickers and washi tape. Now I doubt I’ll be doing all this in the school year, but it was a fun hands-on creative project for the summer! 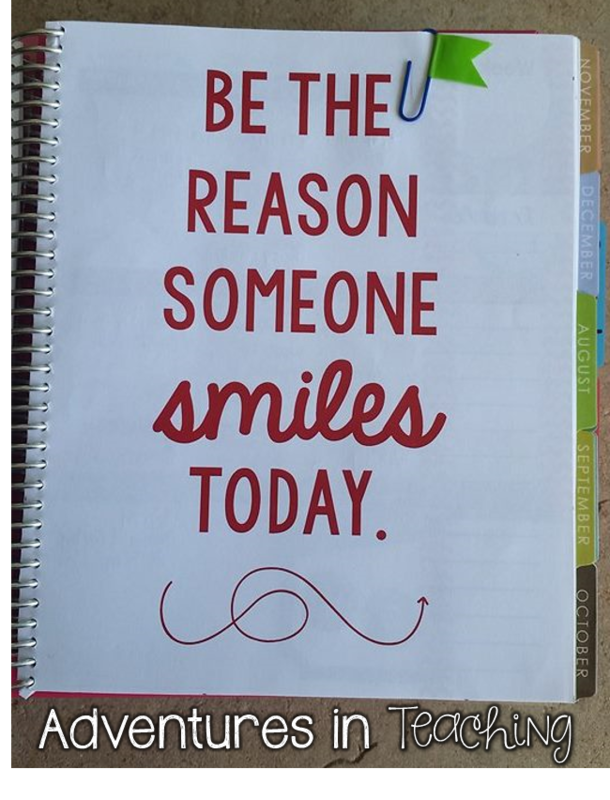 :) I use mostly pencil when writing in my planner, mainly because if something changes, I can erase. I don’t like crossing things out! I’m a nerd that way. Now since my book is a planner AND a notebook, I made dividers and added some stick-on tabs for the notebook section. These pages will be where I write TpT/blog ideas, to-do lists, notes, school thoughts, and of course, doodles! I will probably be sticking a lot of post-its in here, too. I also grabbed this super cute pink box to store all my stickers/tape/decorating stuff so that it didn’t take over my desk dining room table. Let’s just say, hubby was glad when I bought the box and got the “crafty stuff” off his side of the workspace. There is also a GIVEAWAY going on for this linky! Enter the giveaway on the Rafflecopter and be sure to visit all of the other bloggers who are sharing their planners today! Oh my, that July spread is perfect! It’s gorgeous! I love that you made it work for you. I tried having a personal planner, but I just don’t seem to need one. During the school year I use my lesson planner and just write down side notes that I need to remember, During the summer, I just don’t have that much to plan. I’m kid free so I don’t have a lot of stuff to keep up with. I love that you made your planner work for you though! I love your box with all the goodies! I saw your stamps and am loving the idea of using those! OMG you are just like me and don’t like to cross things off. You can still have fabulous color though!!!! I am obsessed with frixion erasable pens. They are not like the old pens that would smudge when erased. These erase with no smudging and they come in a ton of colors. I live in Canada so can only get them at Walmart or Amazon but I am sure you can get them more places. They are my all time favourite thing!!! What a great idea! I never knew you could add pages into a spiral bound planner/notebook. That takes a lot of patience, but it’s so worth it! I LOVE your July monthly layout! I’m the same way about not wanting to cross off things that get changed- I usually write things on a sticky note unless I know they are happening for sure. Still I have a few things that get changed after I’ve written them permanently into my planner and then I end up using white out… My friends think I’m crazy LOL. Thanks for sharing! STAMPS! OMG so you punched all those holes and snapped it all in? You are patient!!! It is a bit like crafting though- very therapeutic! Have a great week! Can’t wait to see you in Vegas! WP looks good on the Adventure Blog!